What are Luciad’s core solutions and application areas? Marc Melviez - We have a traditional background in intelligence, defence and aviation with NATO and EUROCONTROL amongst our earliest clients. These areas still form the core of our business, but recently we’ve been seeing increased demands from other industries, such as business intelligence, telecoms, banking, logistics, transportation and utilities. We’ve found that these sectors are making the transition from macro-level geospatial analysis to the micro-level analysis of highly granular spatial information and big data, such as the movement of people through buildings and rental bikes through cities. The problems defence turned to geospatial technology to solve twenty years ago are now the problems commercial organisations are encountering, so there are a lot of things we have learnt from the defence world that we can today apply to new domains. Can you tell us more about Luciad’s work in Air Traffic Management? 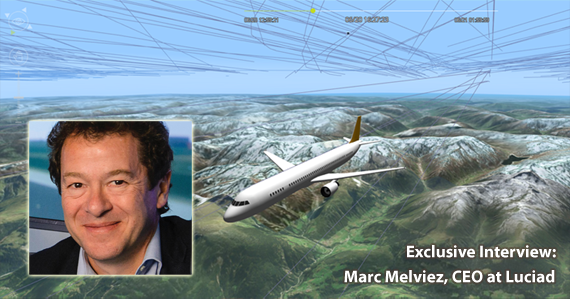 Marc Melviez - Luciad’s work in air traffic management has been extensive, and we have worked with companies such as Airbus Defence & Space, Lockheed Martin and Lufthansa Systems and aviation authorities to produce flight planning and management solutions. We provided the geospatial component for the Collaborative Airspace Provision Service (CAPS) with Airbus in 2014 to help manage the 30k flights which pass through Europe airspaces every day. This system won “Best in Class” in the SESAR SWIM Master Class awards in 2014, which is something we are very proud of. More recently, we worked with the Civil Aviation Authority of Mongolia (MCAA) and Avitech to create a graphical SWIM compliant digital NOTAM (A Notice to Airmen) for managing complex, overlapping, airspaces. The application was featured in the 2016 SWIM Global demo and received an extremely positive reaction. What challenges did you encounter whilst developing this application for the MCAA? Marc Melviez - Working with the MCAA and Avitech on this project presented complex challenges due to Mongolia’s unique role as a bridge between major Asian, North American and European flight destinations. This can make areas where European and Asian airspaces intersect extremely crowded. Having a system which was SWIM compliant was therefore vital for managing the large and varied streams of data coming from different air traffic control sources. It was also important that we had software like LuciadLightSpeed and LuciadRIA to visualise dynamic data effectively. The flight planning event in our simulation involved an airspace user planning a flight into Chinggis Khaan International Airport (ZMUB) close to an Aeronautical Information Regulation and Control (AIRC) cycle change. A graphical application using digital NOTAM then visualises this complex flight planning situation. A second simulation was also developed to demonstrate how a controllers' situational awareness of several NOTAM can be enhanced through the use of SWIM-compliant digital NOTAM. Applications such as these are essential because we have seen a huge increase in the amount of global air traffic in the last few years. Traditional point-to-point systems used for air traffic control and management solutions are being lost in favour over solutions that support system-wide interoperability, information access and exchange. This change is critical to the effective handling of the expected increase in global air traffic over the next few years. The unification of SWIM compliant systems represents a huge transition in how information management is done in ATM. How do you see the role of GIS in air traffic management developing over the next few years? Marc Melviez - We certainly see GIS as continuing to be an integral part of the Single European Sky project. As we’ve seen with CAPS, air traffic systems which are capable of dealing with the ever-increasing number of flights and which are able to share geospatial information quickly and efficiently will be an essential part of ensuring that the project is a success. We also see geospatial systems being used to provide real-time support during flights in the future, rather than simply being used to plan flights or airspace changes. This is something that is certainly starting to happen – our work with Lufthansa Systems’ Lido/Flight 4D planning application is a good example. In essence, high performance geospatial systems which are developed with the principals of SWIM at their heart will be essential to ensuring that air traffic management can scale to meet future challenges.